It may not look like spring yet (still too much snow! ), but there are definitely signs of spring coming to the cabin. From the animals returning outside (foxes, owls, robins, and more) to spring cleaning inside the cabin, the season is slowly changing. This spring is especially significant to us because it marks one year of living in our cabin! We’re feeling lots of nostalgia this time of year, and it’s been interesting to reflect back on a full year of cabin life. Overall, spring is a welcome change after our first winter. With spring, we’re saying goodbye to cabin fever, record snowfall, and colder temperatures than I’ve ever experienced. If it wasn’t for animals returning to the area around the cabin, we probably would have missed the start of spring. The landscape hasn’t changed much (still several feet of snow…), so animal sightings were the first signals of spring. Most of the wildlife around the cabin is gone during winter, with only a few coyotes and moose wandering through last season. Foxes are hunting in the yard, the Great Gray Owl is hooting again at night, and we’re spotting new birds every day. My husband hung about 7 bird feeders around the cabin (he’s excited for spring too) so we’re making the most of watching the animals come back. 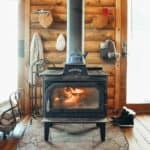 After a long winter, spring cleaning brings new life to the cabin. Winter brought messes of snow & firewood in the cabin. I had no idea how messy firewood is…but ours left little wood chips everywhere (not ideal with a crawling 10 month old)! It feels good to do some deep cleaning and get rid of the remnants of winter. I’ve also been re-organizing the furniture. There’s nothing like changing up furniture/decor to make a space feel fresh. We spent a lot of time at the cabin this winter, so these changes to our space are welcome. There is some *slight* snow melt. Trust me, we are keeping track of every inch that melts! Our fence line was completely covered by snow two weeks ago and now we can see the top (yay). However, we are still getting snow and will probably continue to get more for at least another month. We’ve been spending more time outdoors as a family throughout last couple of weeks. This is due to a combination of warmer weather, more sunlight, and wanting to make the most of spring. After this winter, we had a significant realization that we need to make the most of the warmer months here because they go by fast! We have been snowshoeing in the yard, going on long walks in the area, and visiting Grand Teton National Park. As of this month, we’ve been at the cabin for a full year. We’ve learned a lot this past year, and it feels good to go into the next one with more experience under our belts. This past year, every season in the cabin felt new. From cabin life to having a baby to moving to a new town, there was a steep learning curve! But now we’ve experienced all four seasons here, and we have a better idea of what to expect the second time around. Happy spring! What does spring look like where you are? Drop a comment below and share how you’re bringing in the new season. 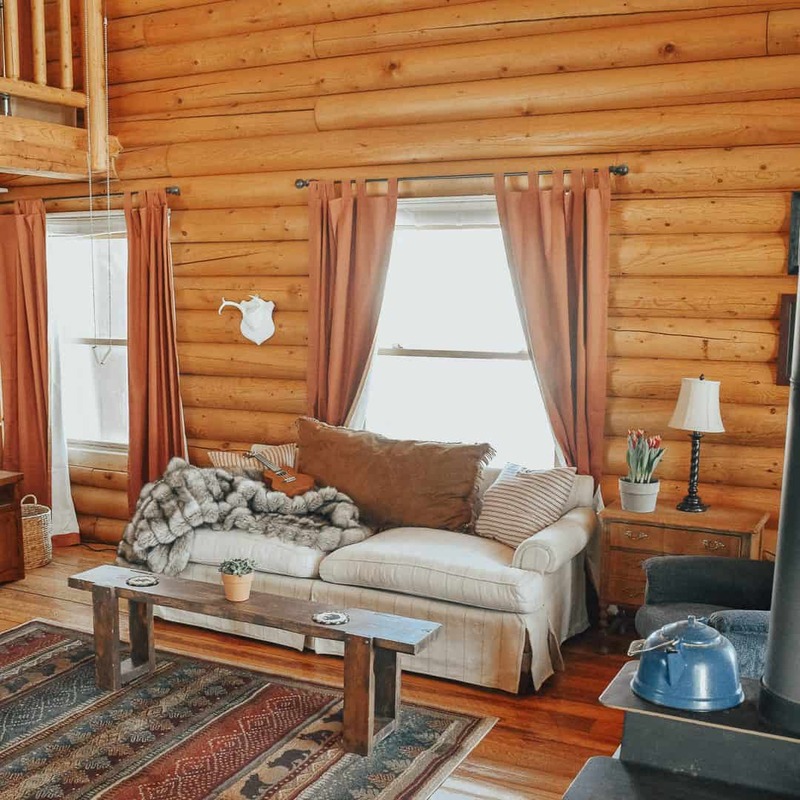 If you’re in a cabin or looking to bring some of cabin life to your home this spring, check out these Cabin Essentials for Spring. And for more posts like this, check out the Cabin Life series. Spring in the Smoky Mountain National Park is beautiful this year. The trees are budding. We will still have cold weather and maybe a snow flake or 2 but spring is definitely here. Today it is supposed to be 78 degrees. We have a log cabin about 1 mile from the park. That sounds beautiful! Your cabin sounds like it’s in a great spot 🙂 We are finally getting some warmer weather (60 degrees yesterday…) but I’m jealous of your 78 degrees! Congrats on one year! Was there this much snow when you moved in last year?